In 2 Kings chpt 04, we read the story of the Shunammite woman who goes in search of the prophet Elisha. The map above shows Shunam (the village where the woman lived) & a possible route she may have taken, to get to Elisha on Mount Carmel. The woman in this Old Testament Bible story hadn’t got any children, but Elsiha predicted that she would have a son (2 Kings 04:15) & about a year later, she did. Unfortunately the son died ((2 Kings 04:20) but that did not deter this formidable woman. She rode a donkey from her home village/town of Shunam, to Mount Carmel, in search of the prophet Elisha. I imagine she believed that the man who had accurately predicted her son’s miraculous birth could also resurrect him. I have identified Shunam & mount Carmel on these maps, & drawn a possible route that the woman might have taken, although the actual route is not mentioned in the Bible story. 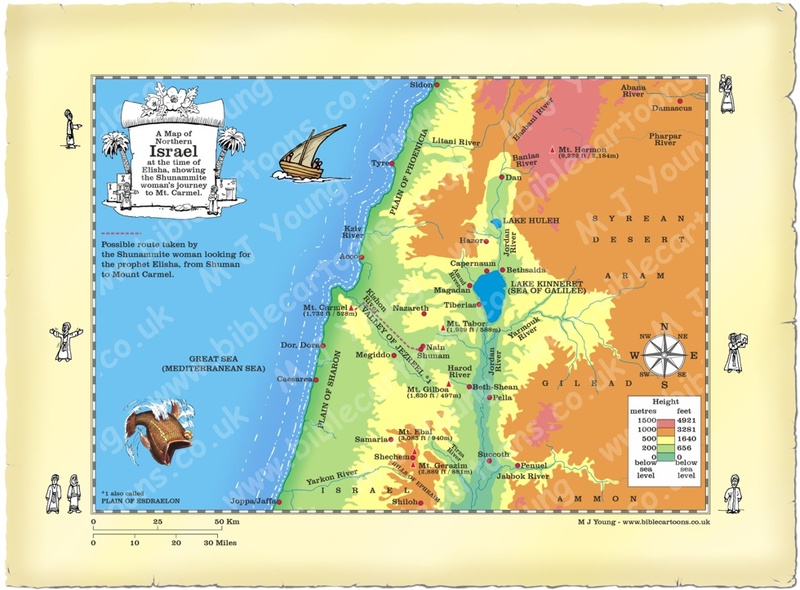 Shunam was a small village in the south eastern part of the Jezreel Valley (which is itself in northern Israel.) It nestles below the base of the Hill of Moreh (Judges 7:1 – The battle of Gideon.) It is marked on my map above. A note about the journey from Shunam to Mount Carmel – how long did it take? As stated above, Mount Carmel is 18.5 miles (30 km) away, in a straight line, “as the crow flies”, so the actual distance could have been 20 miles or more. Bearing in mind that the Shunammite woman was riding a donkey led by a servant, & that she had to travel that distance, I wonder if she would have managed it in a single day. I doubt that she could have travelled from her home village/town, managed to traverse the Jezreel valley, & get up the slope of Mount Carmel, meet with Elisha & Gehazi & then manage to do the return trip, all in 1 day! 18 The child grew, and one day he went out to his father, who was with the reapers. 19 “My head! My head!” he said to his father.